You might be tempted to repair your wires on your own, but it is much safer to obtain our electrical wiring repair services. Wiring repair is not only complicated but can be dangerous for those without the proper tools, experience and training. Our electricians have all three of these things. We will take care of your wiring repair needs for a reasonable price, and you can rest easy knowing that your electricity is in good hands. ● Electrical Outlets. Wiring repair is our most common job. We have fixed many electrical outlets over the years. We can take on your job and complete it quickly and for a good price. Repairing wires connected to an electrical outlet is just another day at the office for us. ● Light Switches. Repairing wires attached to a light switch is another simple job. You might be tempted to take it on yourself, but if you do, you risk malfunctions and electrical shock. Our electricians can take care of a light switch in a few minutes at a minimum of cost and inconvenience to you. ● Three-Way Switches. Three-way switches are a bit more complicated. 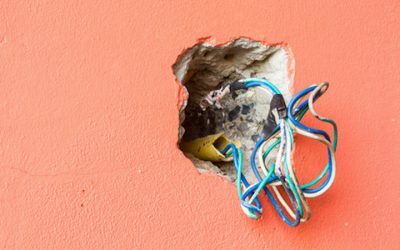 Thankfully, most homeowners don’t attempt to repair these wires themselves. This job takes a bit longer than wiring a standard light switch, but should still take less than an hour. ● Dimmer Switches. Dimmer switches are more complicated still. Some ambitious homeowners attempt to do dimmer switch jobs themselves, but this is another task best left to the professionals. Dimmer switches do have the necessary power modulation built into the switch, so the job isn’t too difficult. ● Phone Jacks. Believe it or not, many people still have land lines. Land lines are more common in offices than in private residences. Regardless of where the phone jack is, professional electricians can wire it up. This job isn’t as simple as some of the other ones mentioned here. Phone jacks use specialized wires, and some of the hardware is relatively delicate, making this one of the most common electrical wiring repair services we offer . ● Circuit Breakers. Circuit breakers have an intricate system of wires connected to them, and repairing these wires should only be attempted by a professional. An improper repair job may result in electrical problems for your entire home, and that can increase the risk of fire or other damage. An electrician should be able to complete this job in a few hours. At Bryan Electric, we can take on all of these jobs and more with our electrical wiring repair services. We’d be happy to answer any questions you might have about wiring repair or any other electrical matter. Give us a call at (770) 680-2144. We are located in Alpharetta, Georgia and will take any jobs in the area.